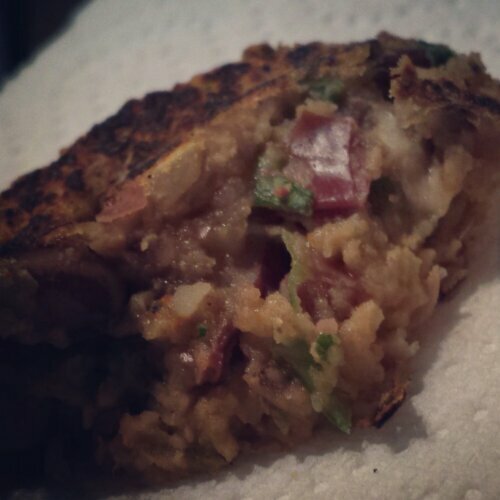 A couple of weeks ago a friend shared a Slimming World recipe for sweet potato onion bhajis with me. 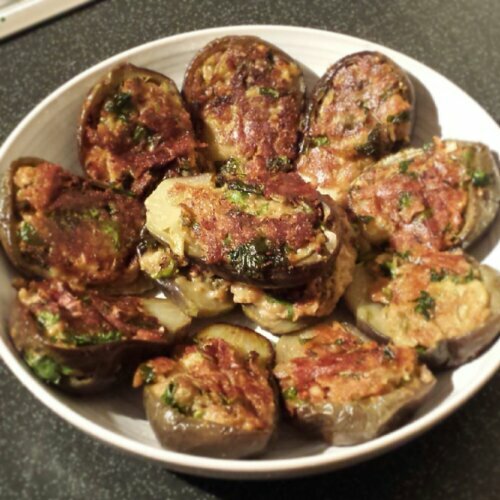 Baked rather than fried, I thought they were worth having a bash at and I’m so glad I did! Delicious moist, and not dripping in grease, these bhajis will certainly have you coming back for seconds. Slice 3 large onions and fry until soft with 4 minced cloves of garlic. 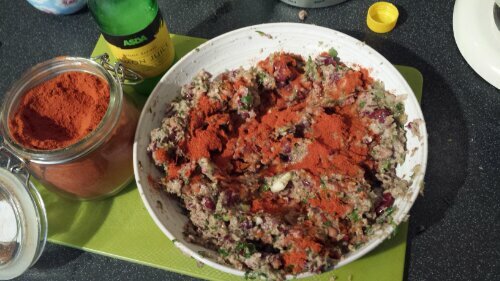 Once softened add in 1 tablespoon turmeric, 1 tablespoon curry powder (I used hot madras) and a 1/4 to 1/2 teaspoon chilli flakes. Keep on the heat for another couple of minutes to allow the spices to release their flavour. Turn off the heat and allow the mixture to cool to room temperature. Whilst it is cooling, peel and grate 2 sweet potatoes. Add them into the onion mixture, and once cooled mix in two beaten eggs, a generous pinch of salt and a grind of black pepper. 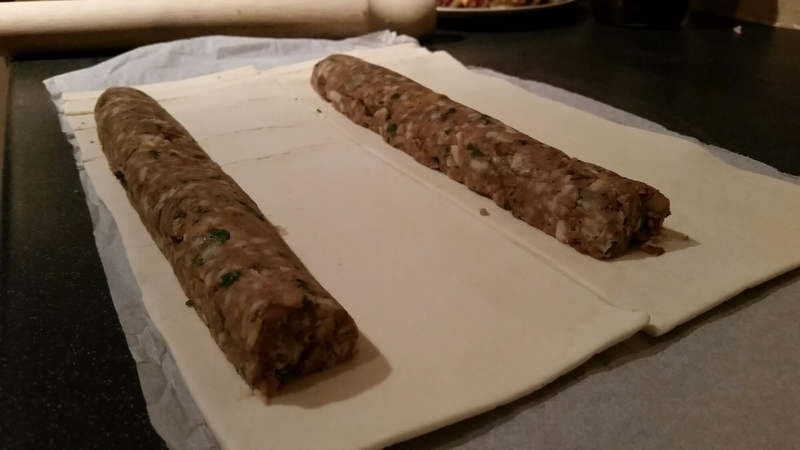 Line a baking tray with greaseproof paper, take a large handful of the bhaji mixture and shape into a rough sausage shape on the tray. 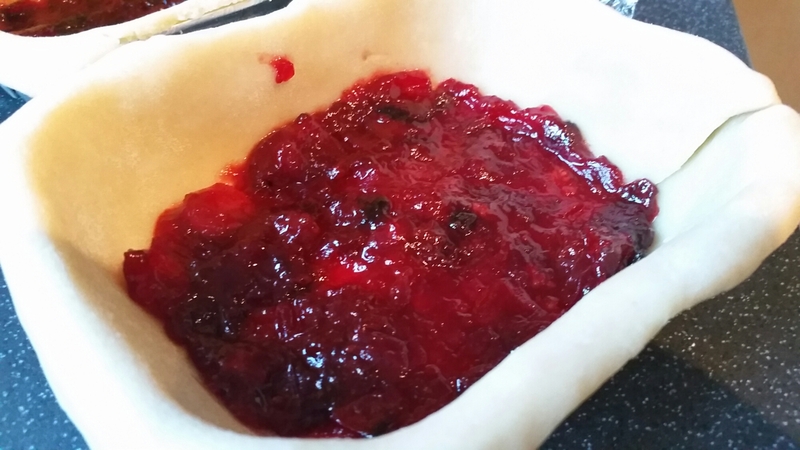 The mixture will be fairly wet, but don’t worry, just form it as best you can on the sheet. 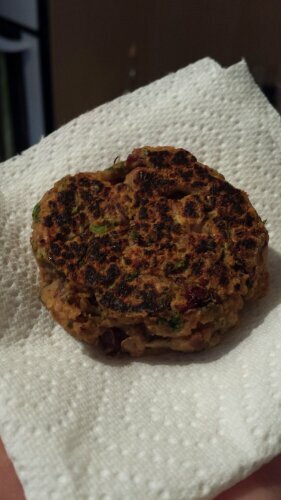 This mixture made 6 decent size kebabs. Bake at 170 fan for 30 minutes until golden and crunchy around the edges. 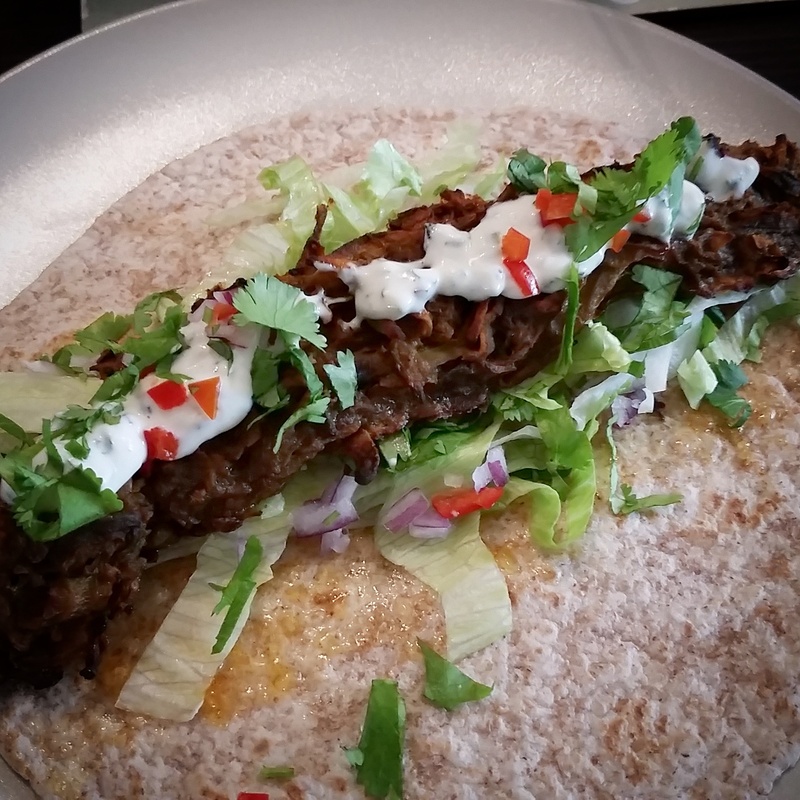 I served these on chapattis spread with a dollop of mango chutney, shredded iceberg lettuce, cucumber batons, finely diced red onion and chilli, a generous sprinkle of chopped coriander and a cooling drizzle of minty raita. Delicious! 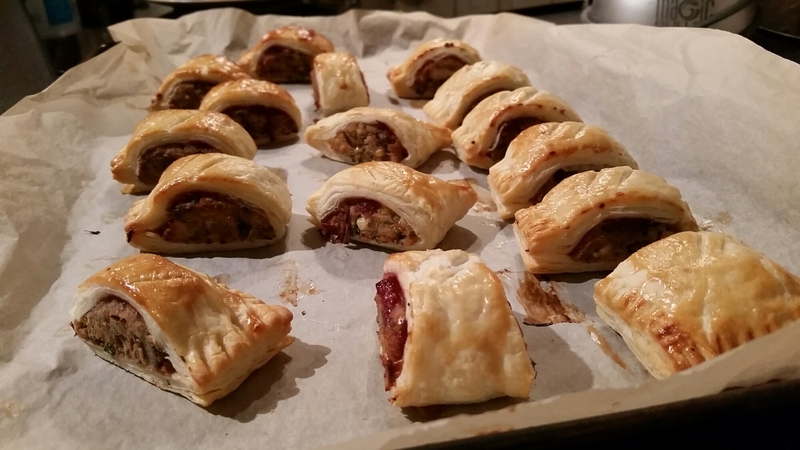 Firstly, let me start by saying the only thing sausage about these sausage rolls is the shape. 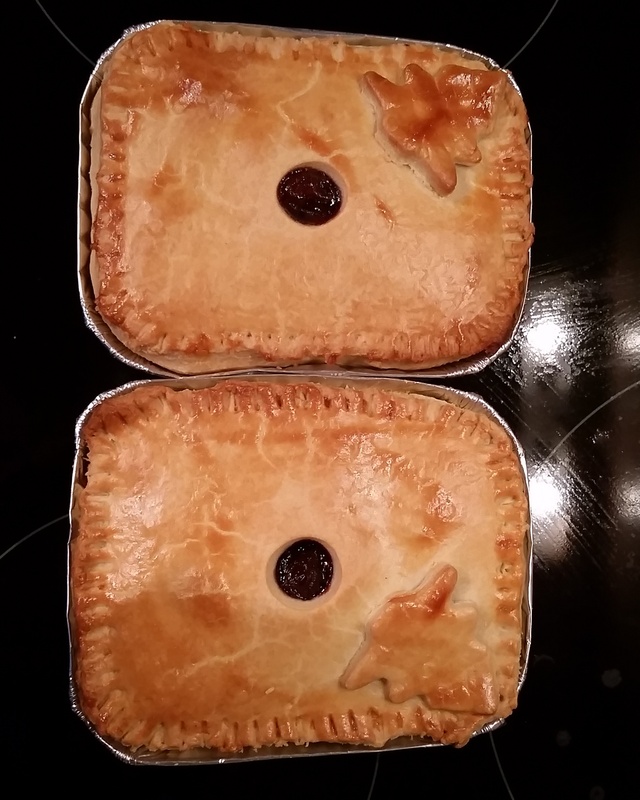 There is no pork in these bad boys! 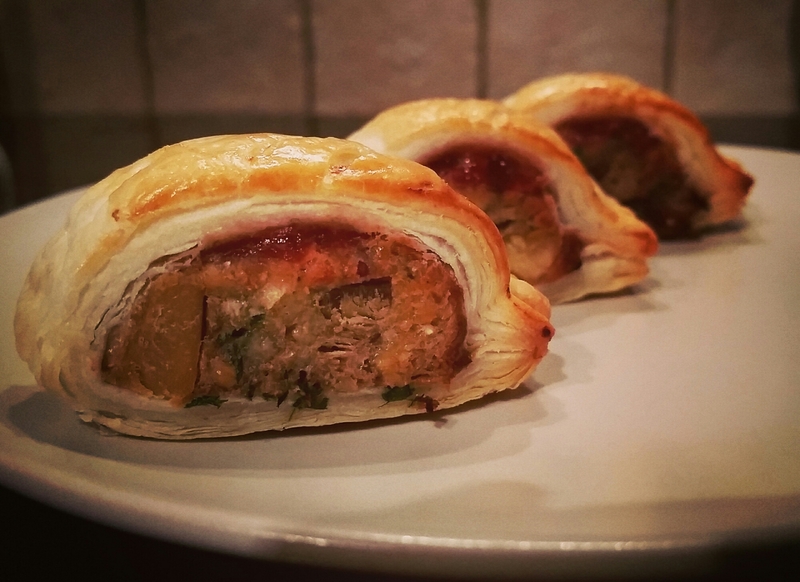 The usual cheese and onion roll substitute is undeniably delicious, however these are, well, a little more meaty and make good use of a couple of key seasonal ingredients. 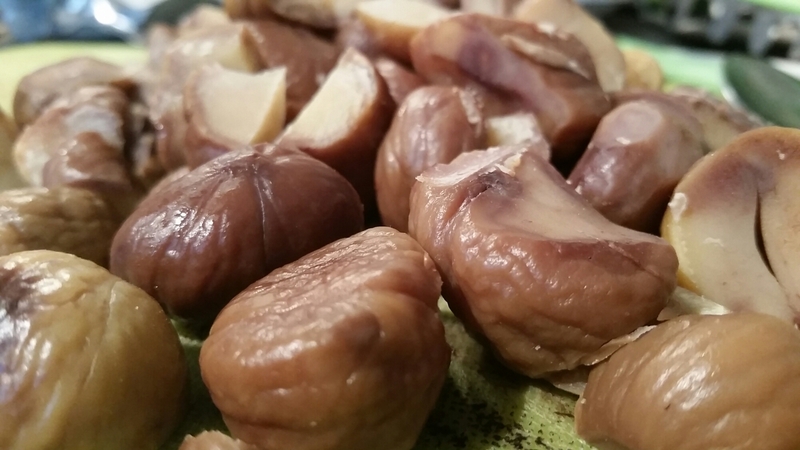 I used two 180g bags of cooked chestnuts, grinding one bag up with the grinding blade of my nutribullet and roughly chopping the other. 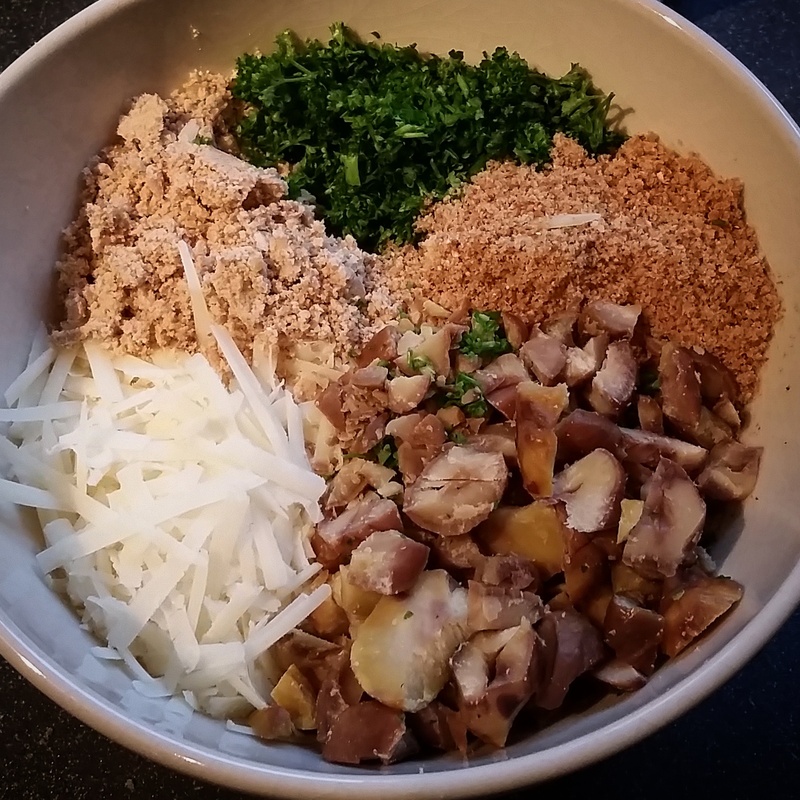 I mixed these with wholemeal breadcrumbs made from two slices bread, two crushed garlic cloves, a wedge of pecorino cheese grated, salt (although be sparing as the cheese is quite salty), pepper and a handful of chopped parsley. Mix the ingredients together and then bind them with a couple of beaten eggs. 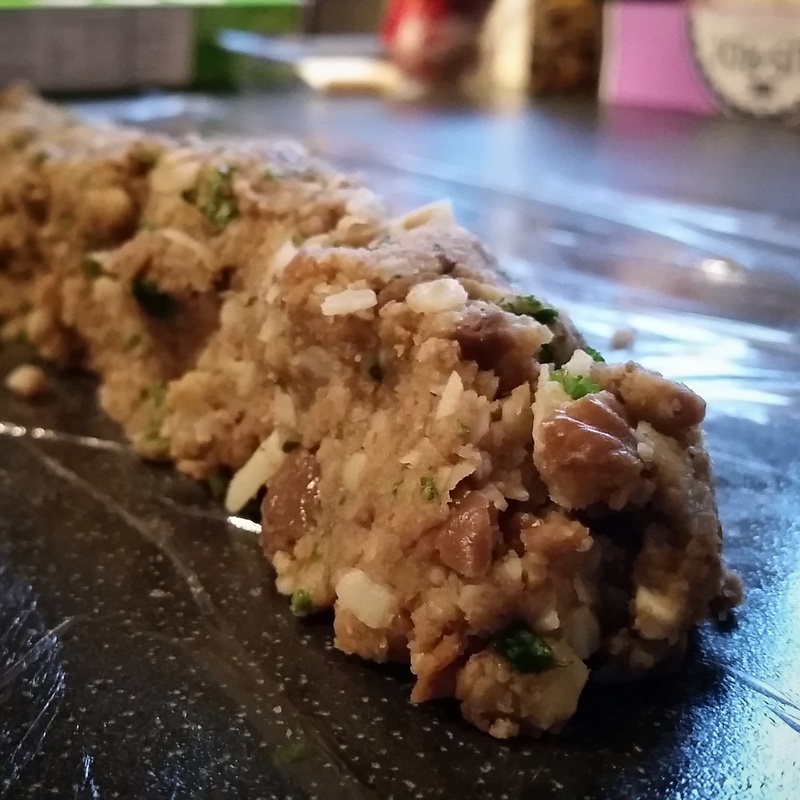 Tip the mixture onto a sheet of clingfilm and roughly shape into a a sausage. 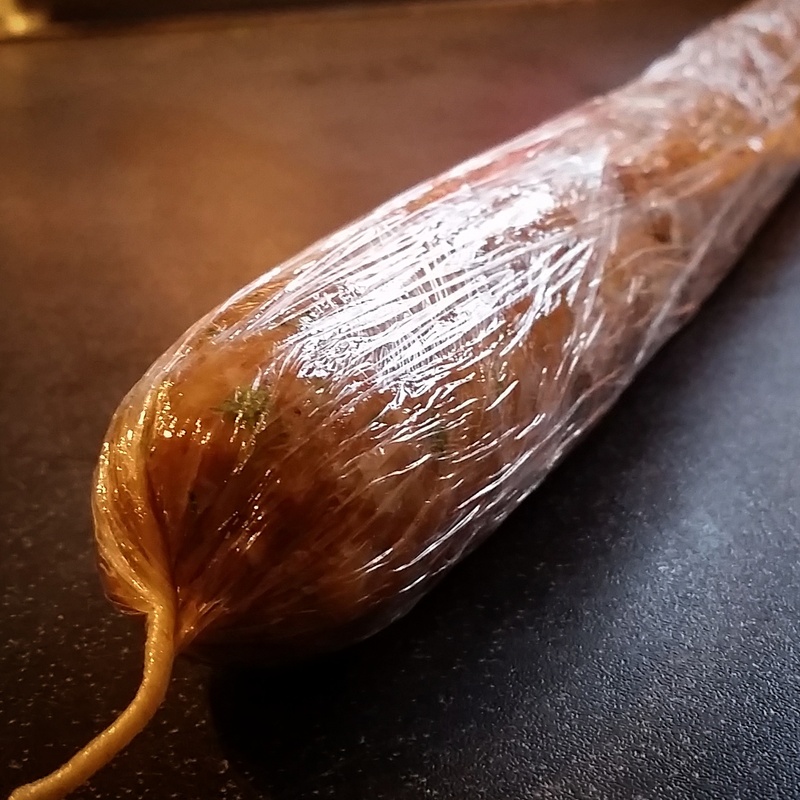 Wrap the clingfilm around it, rolling as you go until you get a long sausage shape. Chill in the freezer for half an hour. I had to chop mine in half to make it fit. 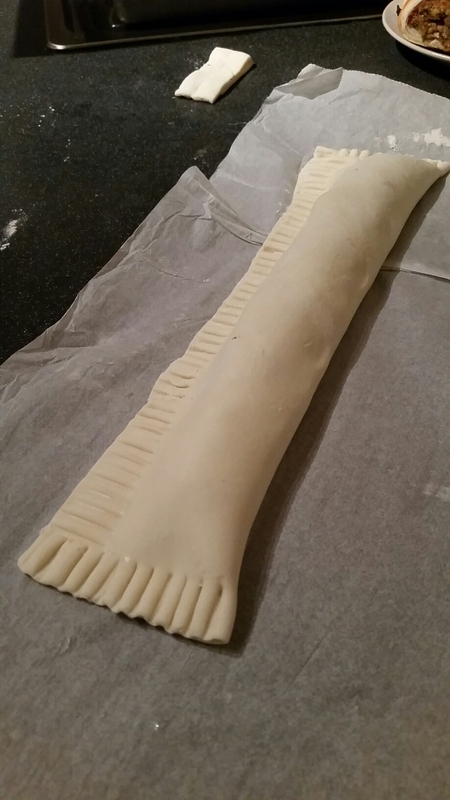 In the meantime take one of two shop bought pack of puff pastry packs out of the fridge and roll out into a rectangle if it’s not pre-rolled. After half an hour take half of the mix out of the freezer and slice lengthways down the sausage to create two long half moon shapes. 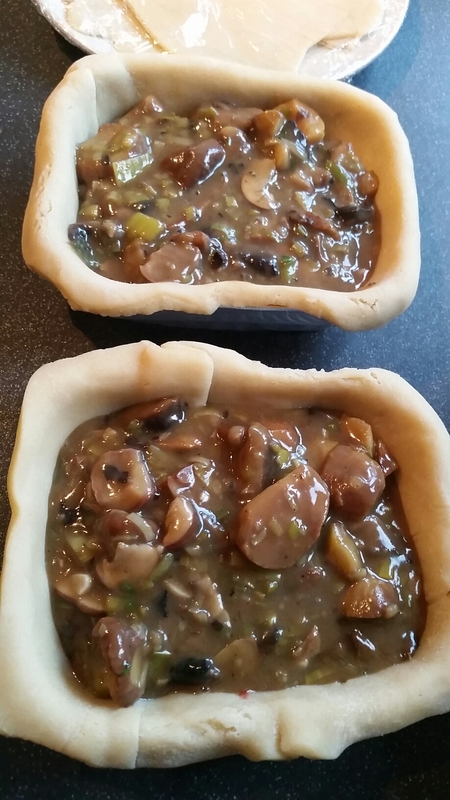 Lay them on top of the pastry as down on the pic below. 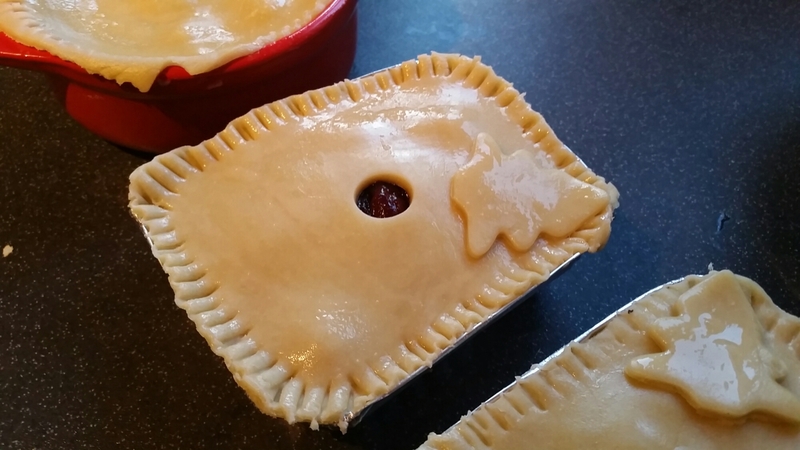 Slice the pastry so each half of sausage as it’s own pastry rectangle. 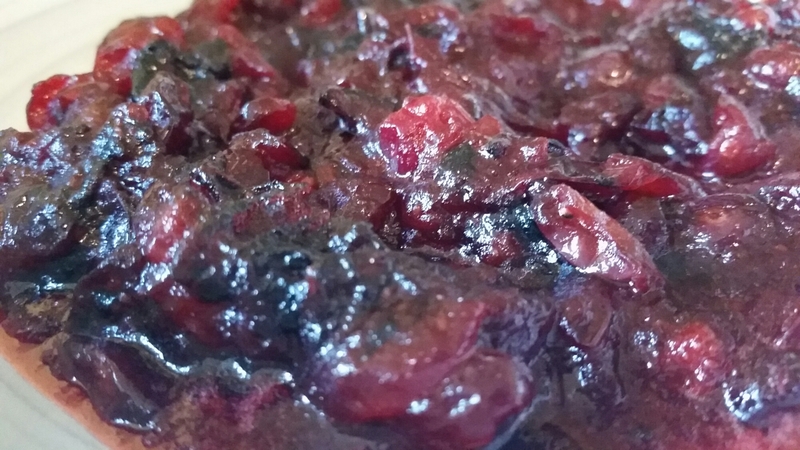 Spoon some cranberry sauce over the top. 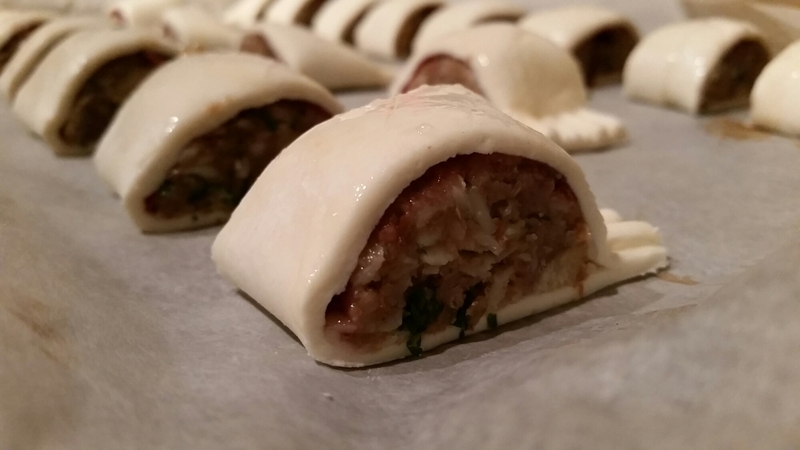 Egg wash around the side and fold the pastry over the top of the sausage crimping with a fork to seal. 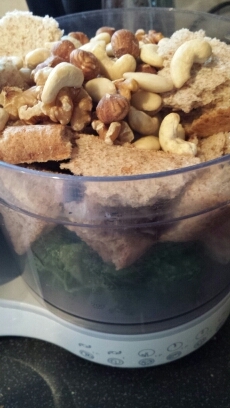 Trim the excess edges off to neaten, put on a tray and repeat with the other side. Chill in the fridge for another half an hour, then slice into inch wide pieces, score or prick the tops and brush on an egg wash.
Bake at 200oC for about 20 minutes or until golden. 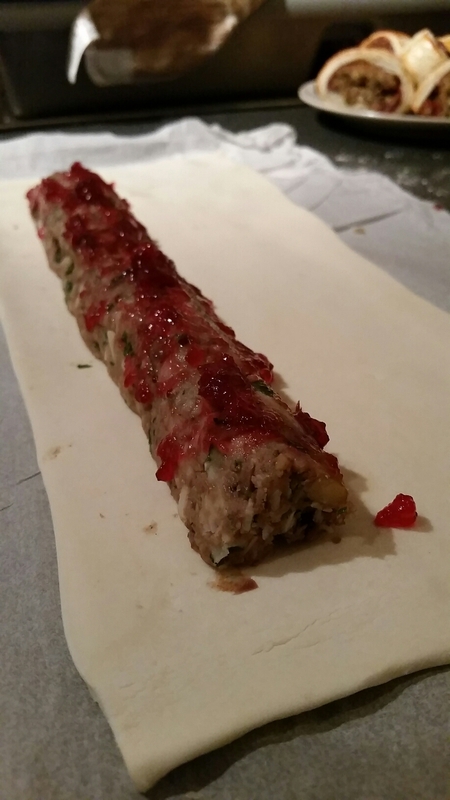 Repeat with the second pack of puff, and the other half of the sausage which should still be in the freezer! 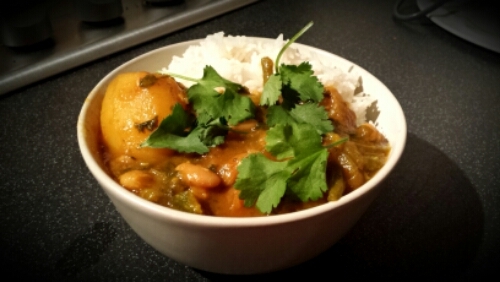 Monday: slow cooker vegetable curry, rice & naan using vegetables we still have in the fridge. £2.60. I loosely followed this recipe although I left out the Coconut milk as I didn’t think it needed it, cut back on the curry powder for Phoebe’s sake, and added in yellow pepper, courgette, frozen spinach and half a carton of passata instead of fresh tomatoes, oh and of course a couple of dashes of lemon juice. 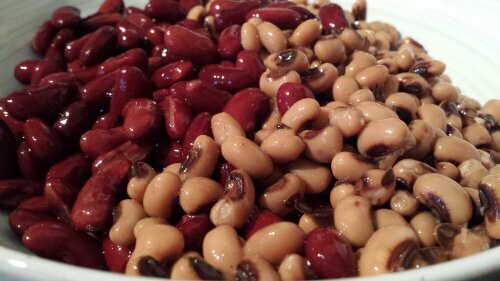 Oooh, and I used white kidney beans because I’d run out of chickpeas. It was lovely. 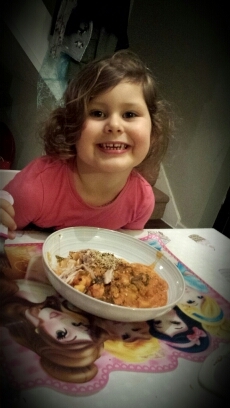 Phoebe was especially excited about tonight's dinner and polished it off in about five minutes! Saturday: Valentine’s Day… I’m hoping my DH will give me the evening off! Sunday: Good old Sunday roast with all the trimmings. I’ll see what offers there are on meat at the supermarket tomorrow. This is a proper old school recipe I remember my mum making when I was growing up. My dad would always groan that there was no meat, but since I married a pescatarian I don’t have that problem! 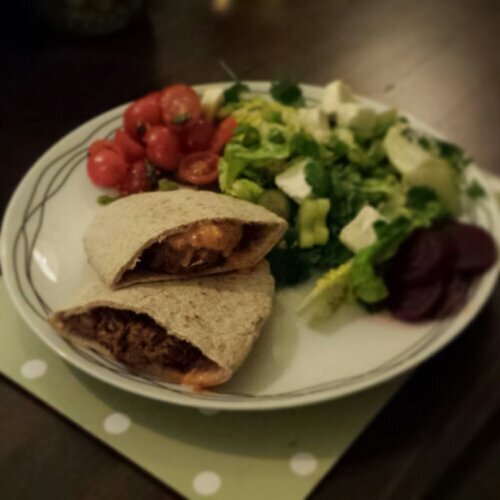 It’s a hearty, no fuss midweek dinner which everyone will like (our three year old is a big fan). 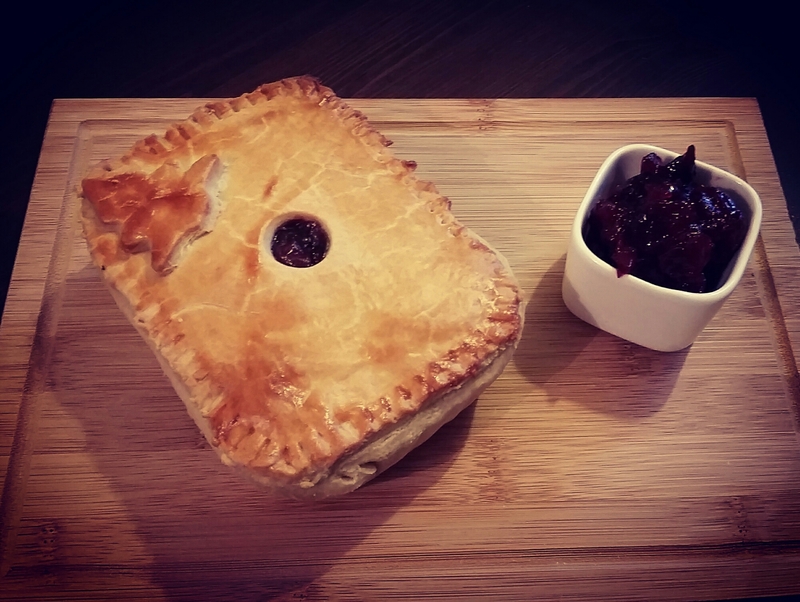 It is a meal in itself, however it makes a delicious side to roast chicken or gammon too. I also add broccoli and a couple of cloves of garlic. Wash and chop all the veg. Fry off the leeks and garlic if you’re using it in a little olive oil. Add the rest of the veg and season with salt and pepper. 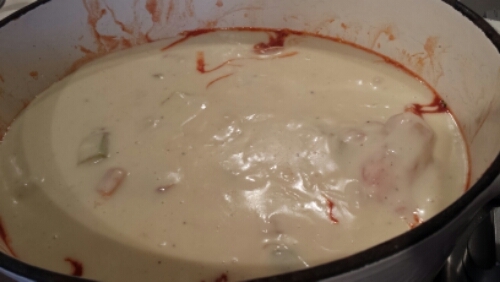 Cover while you make a cheese sauce, but remember to stir regularly to prevent sticking. 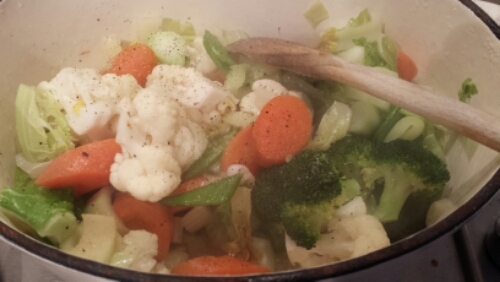 In another pan melt 2oz salted butter and stir in 2oz pain flour and a crumbled vegetable stock cube to make a roux. Cook the flour out for about 30 seconds, before pouring in 3/4 pint of milk a little at a time, stiring continually to avoid lumps. Finally add it a couple of handfuls of strong grated cheddar. Take off the heat. 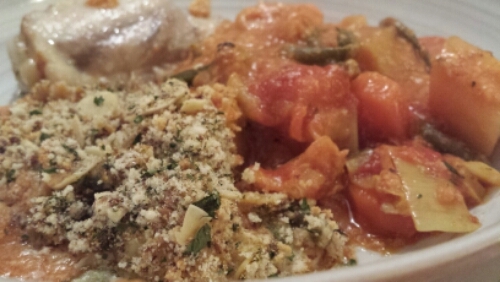 Now pour a can of chopped tomatoes over the vegetables. 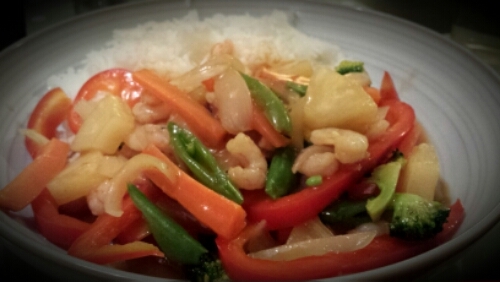 Pour the white sauce over the vegetables. 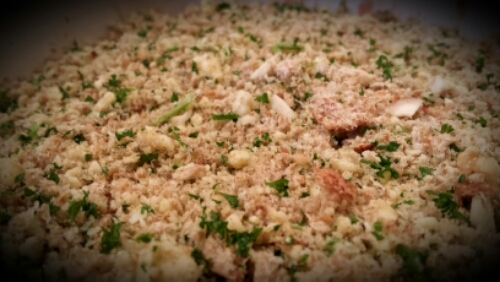 In a blender make a crumble topping by blitzing up a handful of mixed nuts, four slices of wholemeal bread, a large handful of parsley and salt and pepper. Sprinkle on top of the cheese sauce. Bake, uncovered, at 160oC for about 45 minutes. 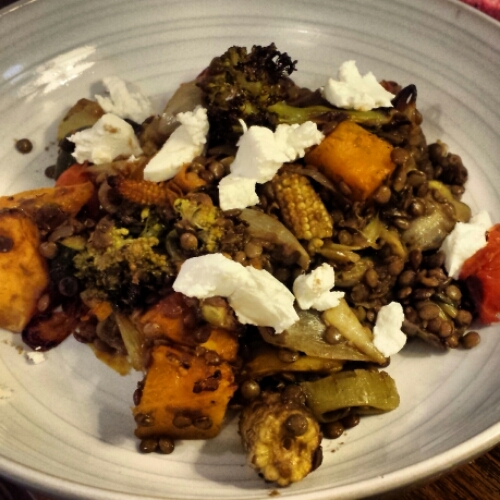 This is the epitome of simple, rustic, midweek veggie dinner ideas. 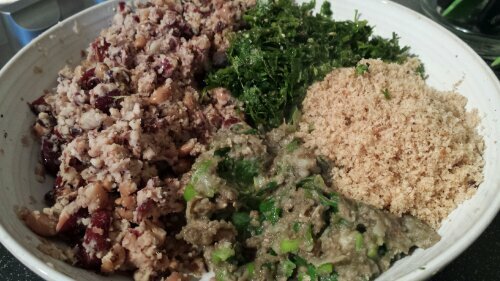 Packed with goodness, your body will smile at the thought of this delicious yet virtuous meal. 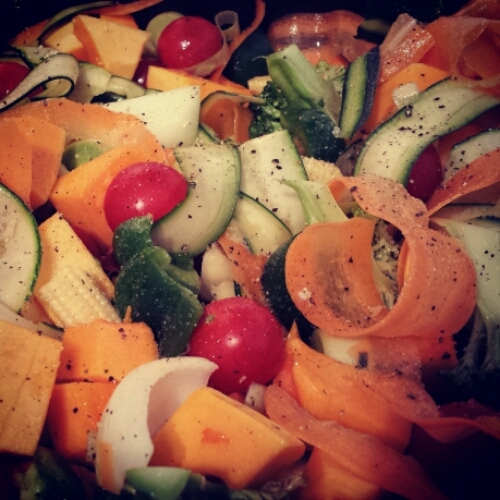 Firstly chop up whatever veg you fancy and put in a roasting tray. 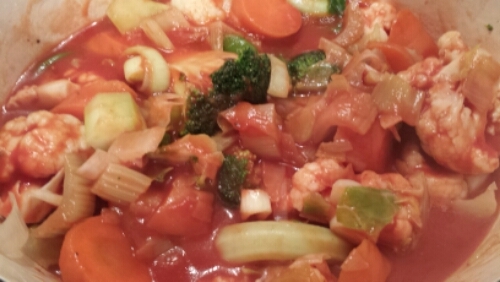 I used onions, garlic, courgette, carrot, baby sweetcorn, peppers, butternut squash, leek and tomatoes. I like to use a peeler to get really thin curls of courgette and carrot. Season well with sea salt and black pepper, then splash in a generous glug of oil of your choice (I used olive on this occasion, but coconut works well too). Bake for about 45 mins in a hot oven turning regular. Whilst the veggies are working their magic in the oven it’s time to get the lentils on. I use a small mug for three of us, and the lentils I use don’t need soaking, merely just rinsing under the tap. Fry off some onion and garlic in olive oil until softened, adding in some fresh herbs halfway through. I used rosemary, thyme and a bay leaf. 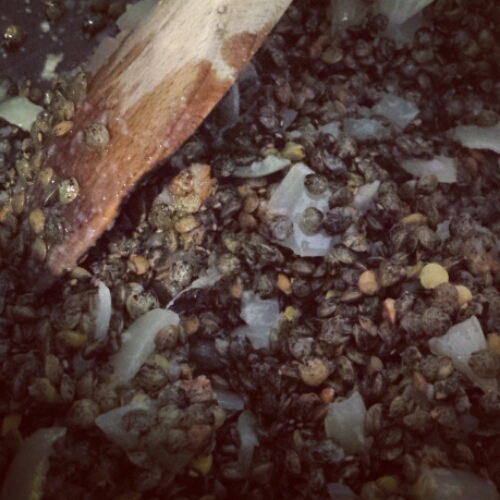 Once softened add the lentils and stir allowing them to absorb some of the flavours from the onion/garlic and herbs. Using the same mug you used to measure the lentils pour in half to a whole mug of red or white wine and let the alcohol cook off for a couple of minutes. 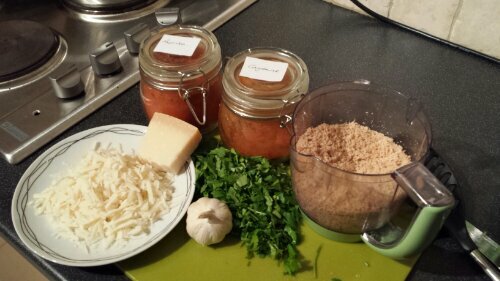 Finally add in two to two and a half mugs of stock of your choice, season and reduce the meat to a simmer. Stir regularly and cook for about 30 minutes, or until they’re at a texture you’re happy with. Puy lentils are renowned for naturally having more of an al dente texture then a lot of other varieties, so they won’t turn mushy. 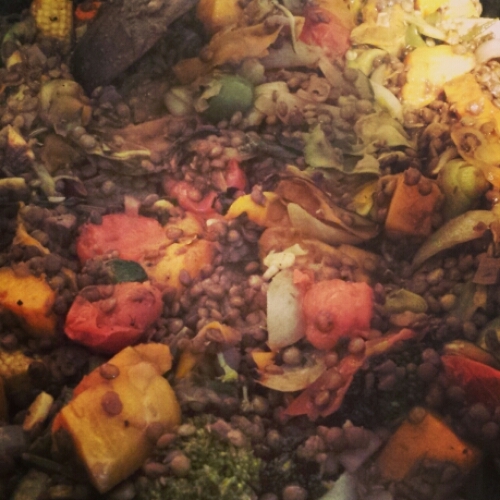 Once the veggies and lentils are done to your liking, pour the pot of lentils into the tray of veggies abse mix well, allowing the lentils to absorb even more flavour. 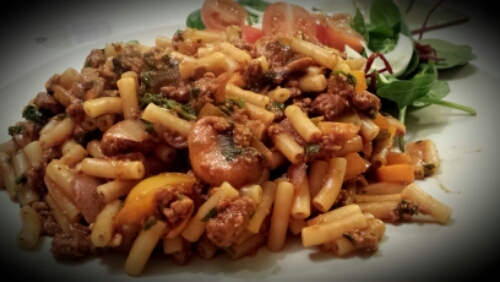 Serve in wide bowls (pasta bowls are perfect) and sprinkle with goat’s cheese. A bag of quorn, one hour, three meals. I am a busy mum and pastor’s wife. I love to cook, but some nights I simply don’t have the time or inclination to prepare a healthy, toddler friendly, pescatarian friendly meal from scratch. This is where my freezer comes in handy. 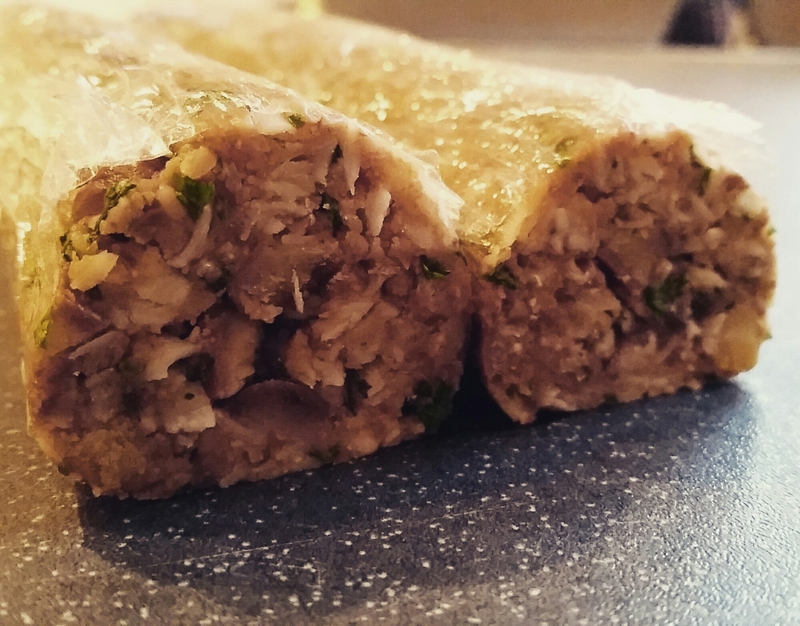 I often find myself making double portions and freezing half so I always have a go-to homemade dinner ready to whack in the oven. 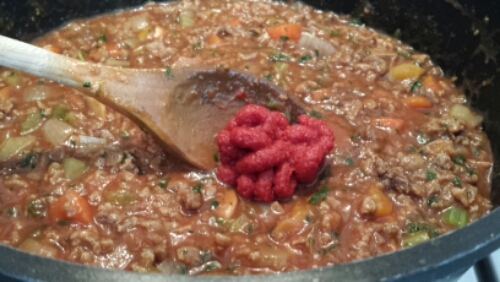 Mince is brilliantly versatile. I use quorn, mainly because the husband doesn’t eat meat, but also because it’s healthier and cheaper than its beefy counterpart. 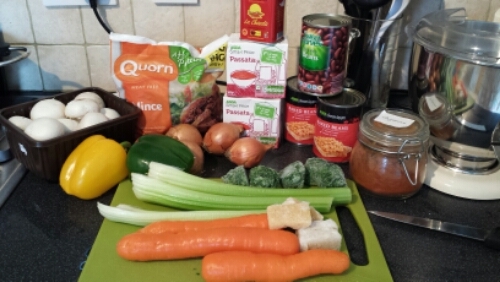 With a bag of quorn, a load of veggies, beans, herbs, spices and a spare hour I can whip up a lasagne, a chilli and smokey bbq beans. Here’s how… Gather your ingredients. I used, 5 small onions, 3 carrots, 3 sticks of celery, a handful of mushrooms, 4 cubes frozen minced garlic, a large handful of frozen chopped spinach, a tin of kidney beans, two tins of baked beans, fresh bay leaves, thyme and rosemary, cayenne pepper, chilli powder, fresh chilli, smoked paprika, Worcestershire sauce, two cartons of passata, tomato puree, dark chocolate, cheese, butter, milk, pasta sheets, a splash of red wine, a couple of stock cubes, an egg and of course salt and pepper, oh and a bag of quorn. This sounds like a lot of ingredients, but trust me it’s more methodical and easier than you think. Dice all the veg, and sauté in olive oil in a large pan. 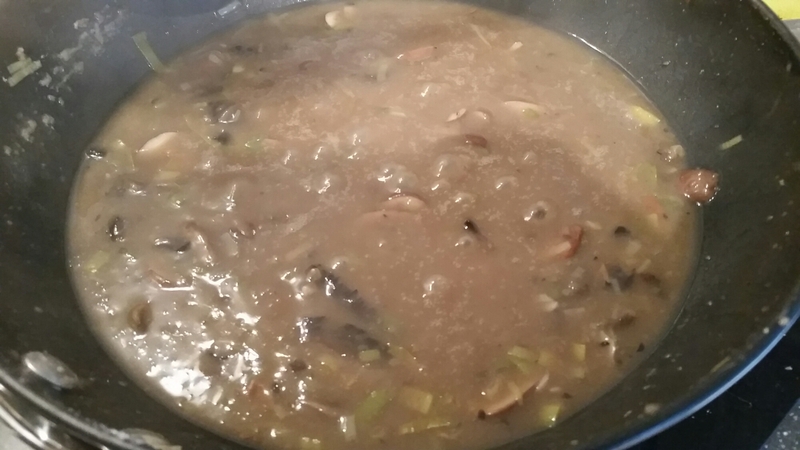 Add in minced garlic, bay leaves, thyme, and a couple of stock cubes before adding in a splash of red wine if you have a bottle open. After about 15 minutes of sweating them down pour in two cartons of passata, one of water and the bag of quorn mince. 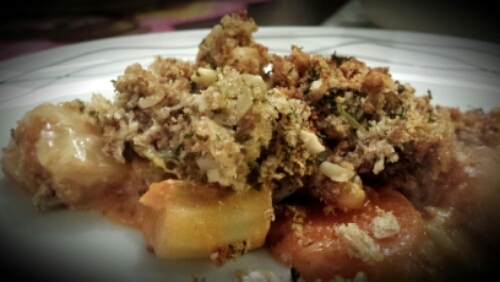 Add in a good dollop of tomato puree and season well with salt and pepper. Bring to a simmer. While it’s simmering make the cheese sauce for the lasagne. 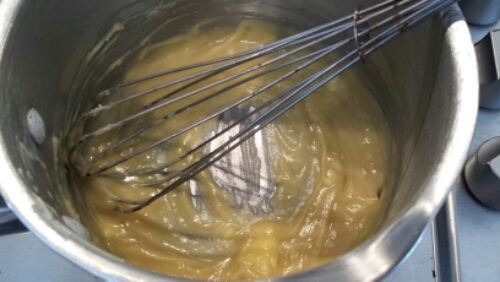 Melt a large knob of butter (approx 50g) in a pan, and whisk in a couple of tablespoons of plain flour to make a roux. Pour in milk, stiring all the time until you get a desired consistency. Throw in a handful of cheese and stir until it melts. At this point I whisk in a beaten egg as I like how it sets the sauce on top if the lasagne, but it will work without too. 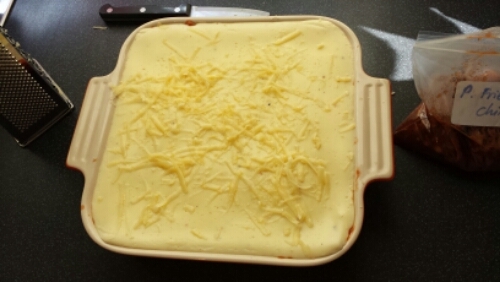 Now layer up the dry lasagne sheets with the sauce in an oven proof dish, before pouring the cheese sauce on top and sprinkling over some extra cheese. Et voila, one down, two to go. 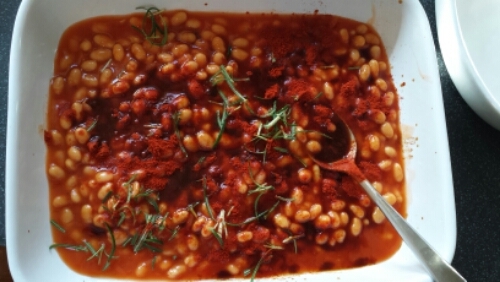 Now, in another oven proof dish pour in a tin and a half of regular baked beans in tomato sauce. 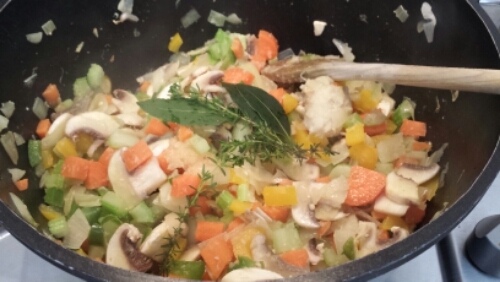 Sprinkle over some freshly chopped rosemary, a teaspoon of smoked paprika and some Worcestershire sauce. 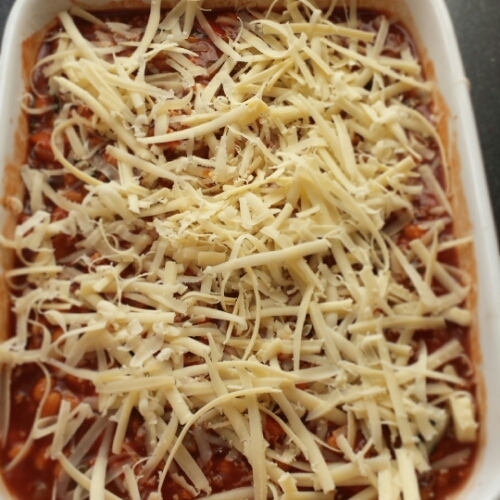 Now add in a couple of ladels of the sauce, mix well and sprinkle with cheese. 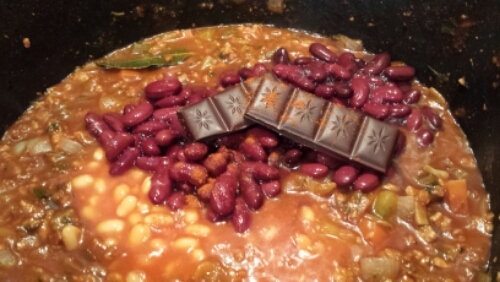 Now, to the remaining sauce in the pan add in the other half tin of baked beans, a tin of kidney beans, some chilli, cayenne pepper and a few squares of dark chocolate. 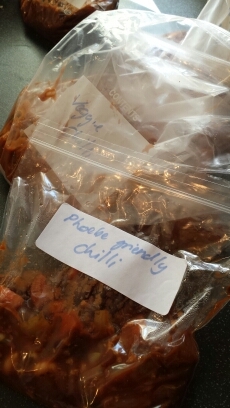 I portioned out some of the chilli for Phoebe before I added too much heat. So there you have it. Three different meals, from one bag of quorn, some veg and beans. 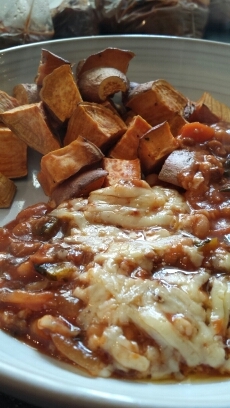 I baked the smokey bbq beans in the oven for about half an hour, and served with sweet potatoes. 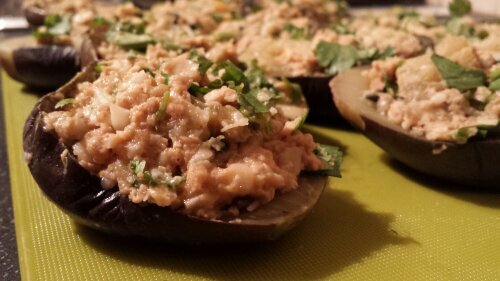 They were delicious and a hit with both the hubby and toddler. 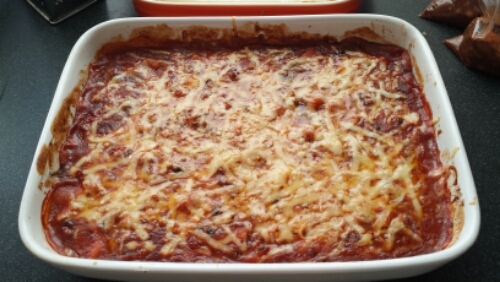 The lasagne is for tomorrow night and I’ve frozen the chilli food a rainy day. 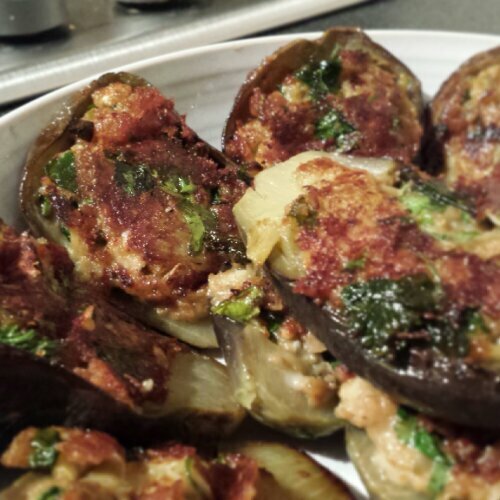 This is a bit of a fusion recipe; a flavoursome amalgamation of Italian and middle eastern ingredients which blend seamlessly to create a real taste sensation. 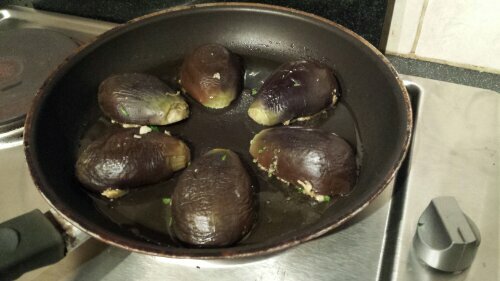 Start off by halving some baby aubergines and boiling in salted water for five or six minutes until soft. 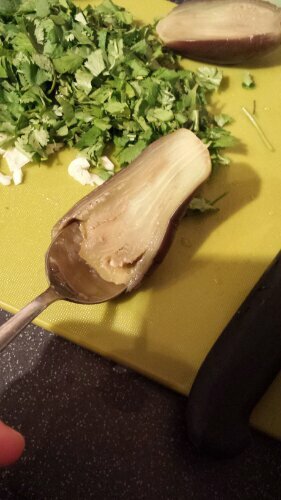 Once soft, scoop out the flesh using a spoon and place in a bowl. Retain the empty skins for later. Add in freshly chopped coriander (cilantro), three cloves of minced garlic, half a teaspoon each of paprika and cayenne pepper, a large handful of freshly grated parmigiano reggiano, lots of black pepper, and maybe a touch of salt (go easy though as the cheese will add some saltiness), and enough breadcrumbs to bring the mixture together. You will need to get your hands in the at this point to give it all a good squelch together. Don’t be shy! 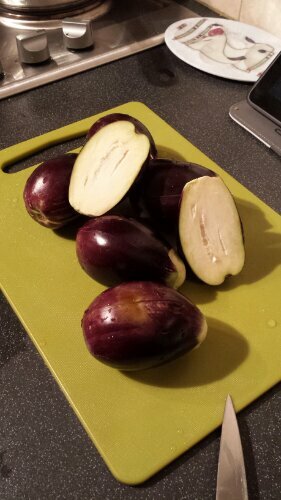 Now, spoon the mixture back into the empty aubergine skins. Place skin side up in a hot frying pan for a couple of minutes to brown and heat through. Flip and fry the bottoms for a minute or so too. 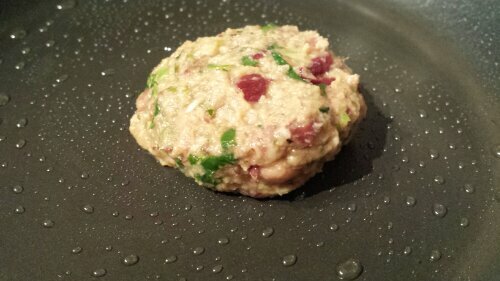 Believe it or not, despite being married to a pescatarian for the last decade, I’ve never once made bean burgers! I had a look online for recipes, but ended up cobbling these together using flavours to our tastes, and what I had to hand. 1 egg to bind if you think your mix needs it. It might stick together just fine without. If you’re vegan just leave it out. 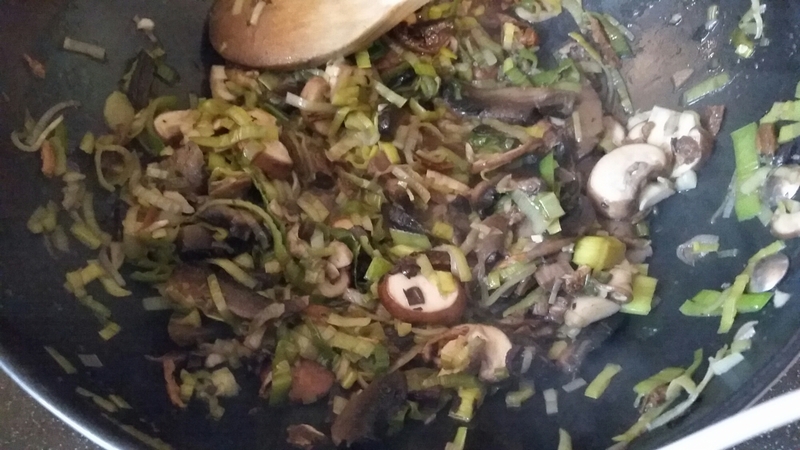 Very finely chop the spring onions and mushrooms and lightly fry with the garlic. Set aside to cool. Put the beans in a bowl and mash with the back of a fork. You want texture so don’t go overboard on the mashing. 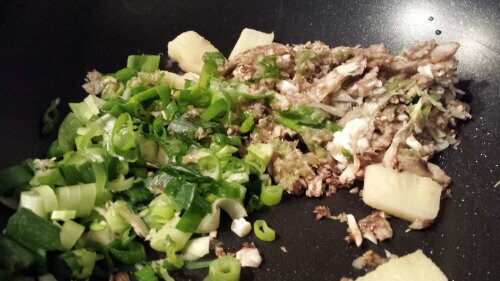 Add in the breadcrumbs, spring onion mixture and finely chopped coriander and mix. Season well with spices, lemon juice and salt and pepper. Trust me, these beans take some seasoning, no one likes a bland burger! Taste as you go along. Add in the egg at this point if your mix feels to dry. If you’re unsure fry a little one off to see how it holds. 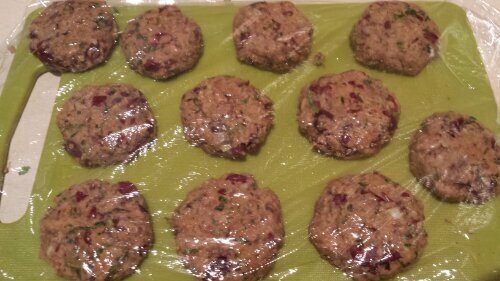 When you’re happy with the consistency shape into little patties, cover with cling and put in the fridge. Chilling them with help them hold their form. When you’re ready to eat put them on greaseproof paper on a baking tray, in a hot oven for twenty minutes or so, turning halfway through, or shallow fry on a medium heat. 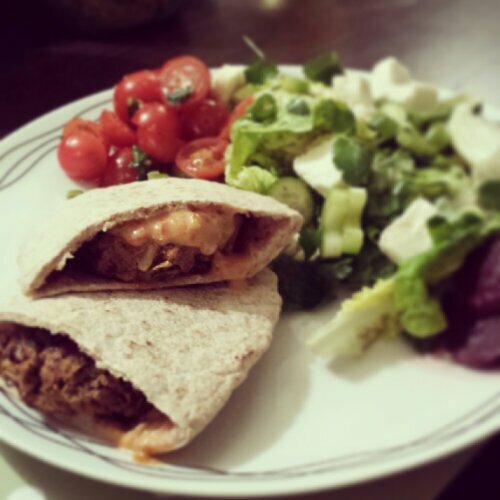 I served ours in Pitta bread with chilli mayo, a green feta salad, and garlic and basil tomatoes. They were a hit all round.